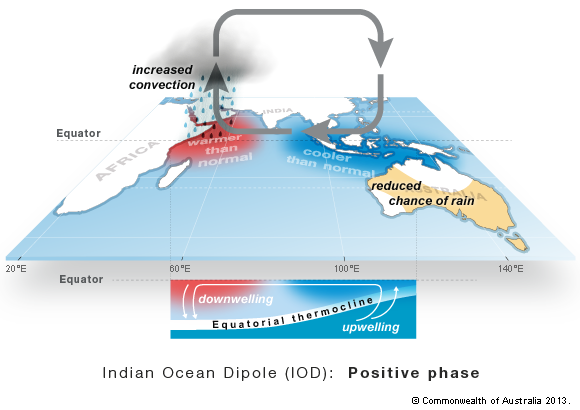 Sustained changes in the difference between sea surface temperatures of the tropical western and eastern Indian Ocean are known as the Indian Ocean Dipole or IOD. The IOD is one of the key drivers of Australia’s climate and can have a significant impact on agriculture. This is because events generally coincide with the winter crop growing season. The IOD has three phases: neutral, positive and negative. Events usually start around May or June, peak between August and October and then rapidly decay when the monsoon arrives in the southern hemisphere around the end of spring. Water from the Pacific flows between the islands of Indonesia, keeping seas to Australia’s northwest warm. Air rises above this area and falls over the western half of the Indian Ocean basin, blowing westerly winds along the equator. 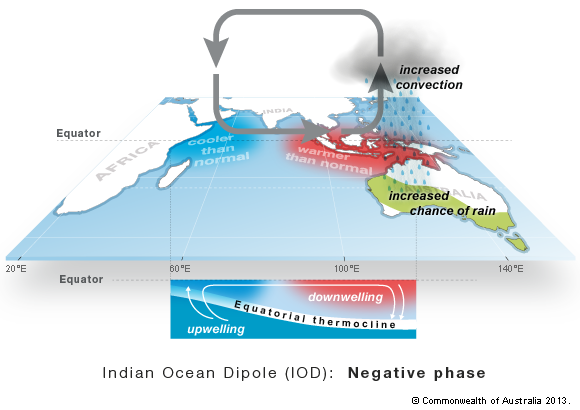 Temperatures are close to normal across the tropical Indian Ocean, and hence the neutral IOD results in little change to Australia’s climate. 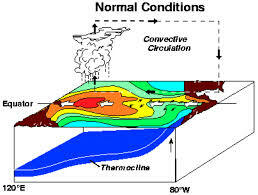 Generally this means there is less moisture than normal in the atmosphere to the northwest of Australia. 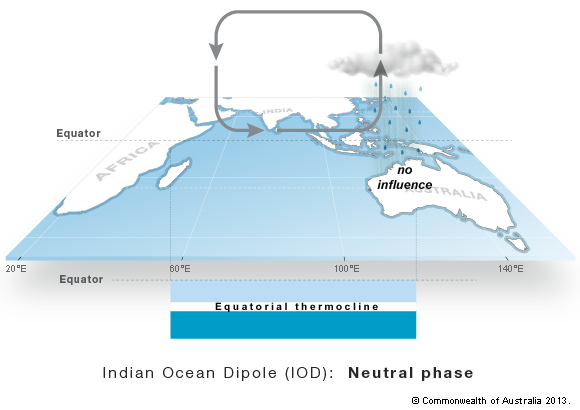 This changes the path of weather systems coming from Australia’s west, often resulting in less rainfall and higher than normal temperatures over parts of Australia during winter and spring.